Having missed the chance to write a Dalek adventure for Series Three and only briefly using them in his Curse of Fatal Death skit and the finale of Series Five, Steven Moffat decided he would finally write his first proper tale featuring the arch nemesis for 2012s Series Seven. The season was due to be split with a break in the middle with the first half writing out Amy and Rory and the second introducing the new companion Clara Oswald. Each episode of the first half was conceived as a ‘mini-blockbuster’ with ambitions to try and match big screen feature films. The Daleks would be the perfect opening for the season and Moffat started his script in November 2011. Gavin’s DWM Cover. Click for a larger view. Ultimately named ‘Asylum of the Daleks’, the tale promised a Dalek “from every era” and a special ‘fold-out’ DWM cover, by Dalek 63•88’s Gavin Rymill, took this idea to the Nth degree to further build the hype with every single variation appearing in full colour. It even came as early as May 2012, several months before the anticipated transmission date. Moffat was aware that the hype generated would be the perfect cover for a surprise he was hoping to pull off. With perfect sleight of hand, he was able to include the new companion in the season much earlier than had been expected. Rehearsals for Asylum of the Daleks. Click for a larger view. Pictures taken of rehearsals raised levels of excitement yet more, as beautiful replica props from the 60s and 70s were seen mingling with New Paradigm versions and other bronze casings. 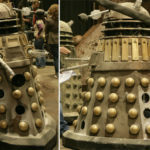 Unfortunately, by the time the props had reached studio, their appearance had been much altered with heavy weathering all but hiding their original colours. Whilst it was true that there was a Dalek from ever era, the story was shot and edited in such a way that it was very hard to tell. In early 2012, the BBC was busy moving its operations from its Upper Boat to its new studios at Roath Lock and as such filming for Asylum of the Daleks ‘flipped flopped’ between the two studios as and when required. 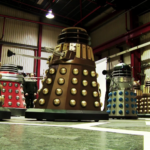 As the hype had promised, the story featured Daleks from every era of the show and as such a huge number of props would be required to fulfil the demand. 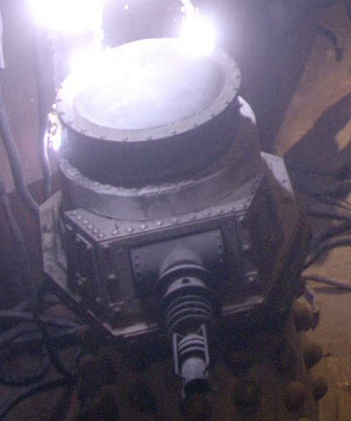 Not only would new props need to be built, a number would need to be borrowed from other sources to cover the previous styles of Daleks. Comparison of the rear of the original NPD and the new NPD-A. Click for a larger view. Despite the reaction to the New Paradigm Daleks, Moffat included them in his scripts. 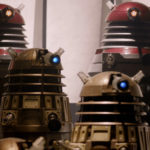 In fact, in interviews since Series Five, he had been indicating that he had conceived them as the superior ranks of the Daleks and the bronze Daleks were the rank and file drones1. 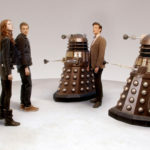 With three of the original five NPDs now out of service (two of them due to their conversion into stone Daleks in the finale of Series Five and the distressed Supreme Dalek in Season Six) only two remained. The team were also keenly aware of the poor reception the new designs had received. On the suggestion of designer Michael Pickwoad and new producer Caroline Skinner, the design was tweaked to address the main issues. The weapons hatch on the rear of the skirt, commonly referred to in some fan circles as the ‘hunchback’, was reduced in size and the rear of the shoulders adjusted so that they appeared to join the skirt rather than the weapons hatch. NSD5 (right) at Media City. Click for a larger view. 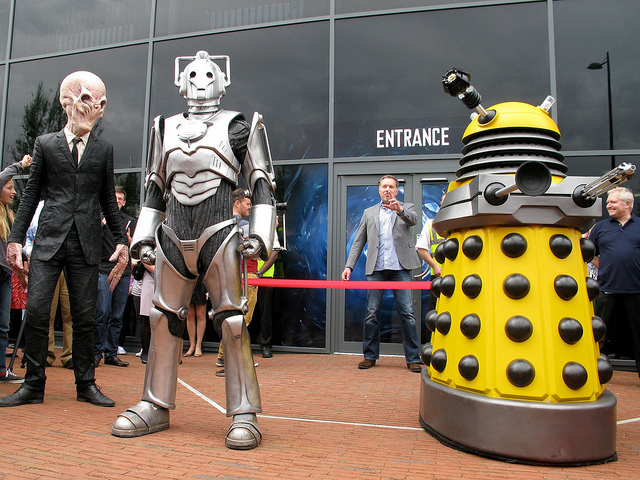 Of the existing available bronze Daleks – MT1 resided at BBC Birmingham with NSD5 now at the new Media City complex in Salford. 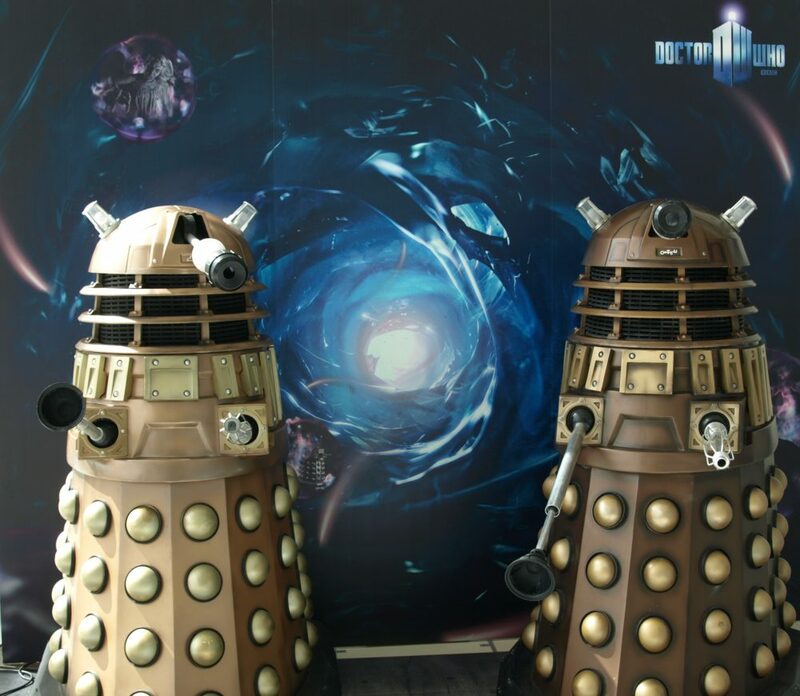 NSD2 and NSD4 had recently been returned to Cardiff from the Doctor Who Experience at Olympia. MT1 was recalled from BBC Birmingham but rather oddly, considering the number of Daleks required, NSD5 remained in Manchester. With the script referring to a huge ‘Dalek Parliament’ that included hundreds of Daleks, it was clear that the three bronze Daleks, now in store at Cardiff, wouldn’t be enough. The decision was taken to boost their numbers. 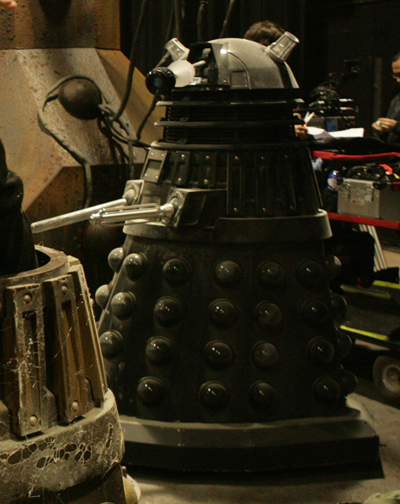 Penny Howarth’s props team at Upper Boat therefore had an unprecedented number of Daleks to manufacture and they worked tirelessly to have them ready in time for filming in March 2012. The new burgundy and blue NPD-A props. Click for a larger view. New NSD props being assembled in Cardiff. Click for a larger view. 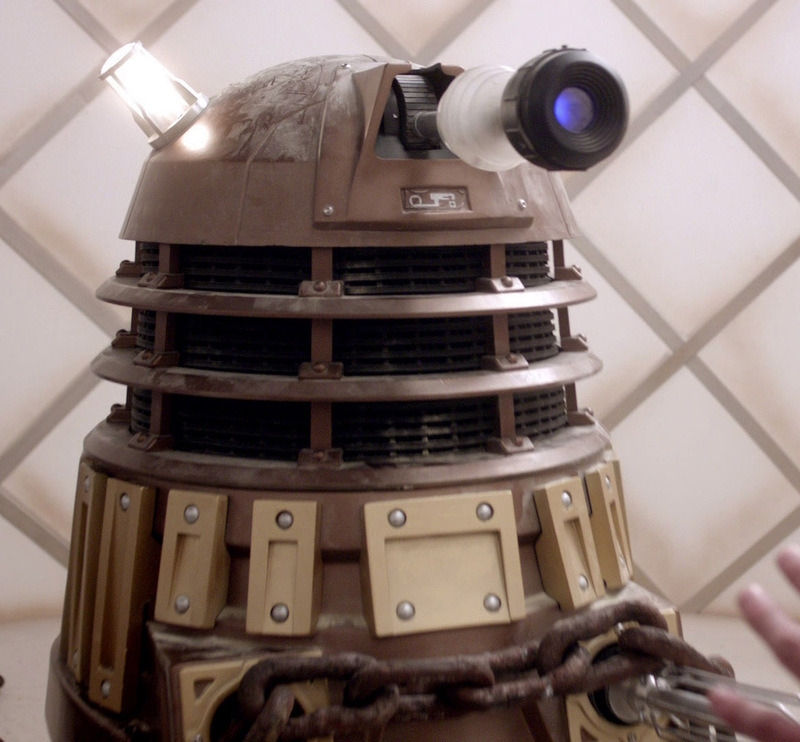 For the bronze Daleks, eight new props were made by the team. 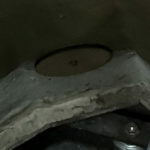 The mould that had been taken from NSD2 for constructing NSD5 for Series Four was reused again, and again, as had happened in NSD5s construction, some of the dents and marks were copied to the new props. Examples of untidy seams and poorly positioned neck rods. Click for a larger view. The sheer scale and speed of the operation, understandably, meant that the Daleks were often not finished quite as well as the original five NSDs. In some cases, the joining of the seam of the two sections at the front of the skirt has a particularly unfinished feel and a number of the slats were placed at different levels and some with slight rotations. Several of the necks also suffered in that the lowest set of rods were positioned away from the neck-bin which made it appear as if the neck was collapsing inwards on its own weight. 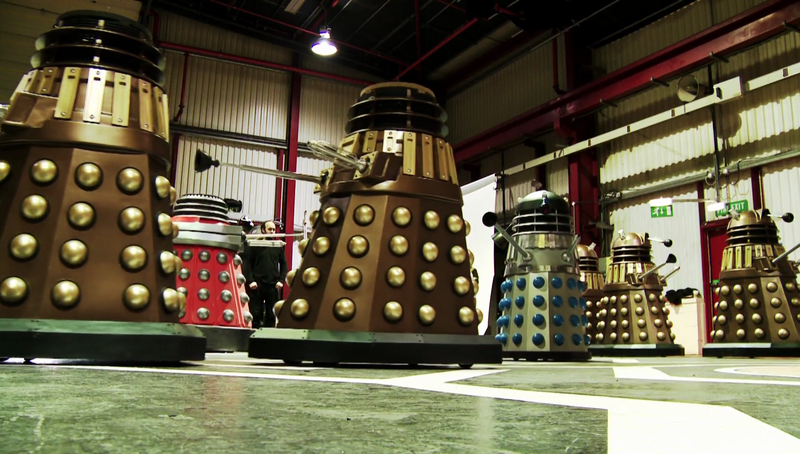 Six of the new Daleks were given a pristine new bronze finish but weren’t weathered or given ID tags on their domes. With the plot featuring an asylum full of deadly, mad and battle damaged Daleks, three of the six had several of the hemispheres removed to give the impression that they had fallen out. This was achieved by cutting a hole into the skirt and filling the space with an ‘inverted’ black hemisphere. We will term these six Daleks NSDA 1-6 (New Series Dalek Asylum 1-6). NSDAs 1-3 all had a ‘complete’ skirt but all six also have unique features to distinguish them. NSDA1 was, perhaps, the best of the finished props. Its slats were all consistently positioned and it had a ‘complete’ skirt. NSDA2 was another good consistent build, but did have a number of scratches on the front panels by the time it had got to studio. It also didn’t have hex bolts on the fender although the remnants of where they had been seemed to survive. Only the skirt section of NSDA2 appeared in the asylum scenes. 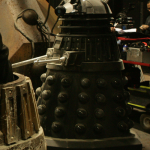 It featured as part of the ‘opened’ Dalek in the intensive care section for which the in-house team provided a number of extra bespoke sections to make it appear as if it was being operated on. NSDA3 had a complete skirt, but a number of its slats were positioned at different levels. It only appeared during the Parliament scenes and by this time had a large scratch on its lower collar revealing the white fibreglass beneath. Whilst NSDA3 was excused from use in the asylum, it did serve another purpose elsewhere. 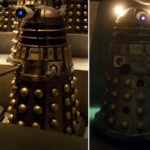 The BBC were aware that, despite being in use since 2005, the bronze Daleks had very few official pictures for use on merchandise and promotional activities and so the pristine new prop was set-up for a photoshoot and many pictures were taken of the prop from various angles. NSDA4 was the first of the skirts with removed hemispheres. The third on the front right panel, the second on the third right panel and three from the rear. The lowest hemisphere on the third left panel was also positioned incredibly low. NSDA5 was missing its top left front and third on the right hand front panels. Its large centre slat was also slightly rotated. NSDA6s skirt was missing the mirror opposite hemispheres to NSDA5 and also two from the rear. 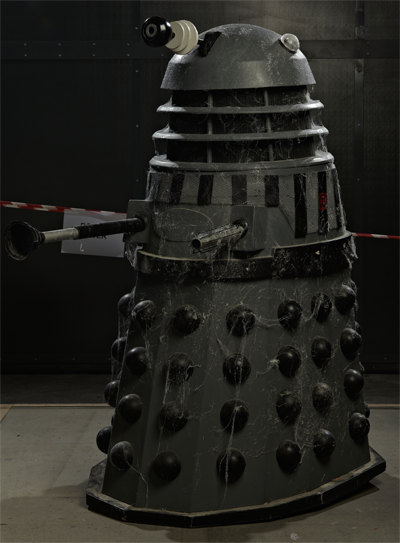 In addition to the main six props, the in-house team created two ‘distressed’ Daleks with extra damage. We call these props NSDAD 1 and 2 (New Series Dalek Asylum Damaged 1 and 2). NSDAD1 was given the most treatment. Its dome had two cracks cut into it, and the shoulders and slats were heavily dented. The arm was removed completely and its box reworked to cover the resulting hole with damage. Not only were several hemispheres removed from the skirt as per the standard NSDAs, a number of damaged ones were also added. NSDAD2s skirt was distressed in a similar manner, however, the shoulders only had several of the slats removed instead of the heavy distressing of NSDAD1. Both props were heavily weathered with dirt and dust. 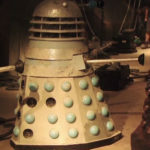 With the collection of pristinely painted Daleks assembled, four of the bronze Daleks and the blue NPD-A were immediately dirtied down with dust and cobwebs and transferred to studio to start on the asylum scenes where they were joined by a number of other borrowed and existing props. MT1 attacks The Doctor. Click for a larger view. Three of the existing NSD props had been returned to Cardiff with NSD5 remaining in Manchester. MT1 remained bronze from its last appearance in Series Four but NSD2 and NSD4 had been painted khaki green for Victory of the Daleks. 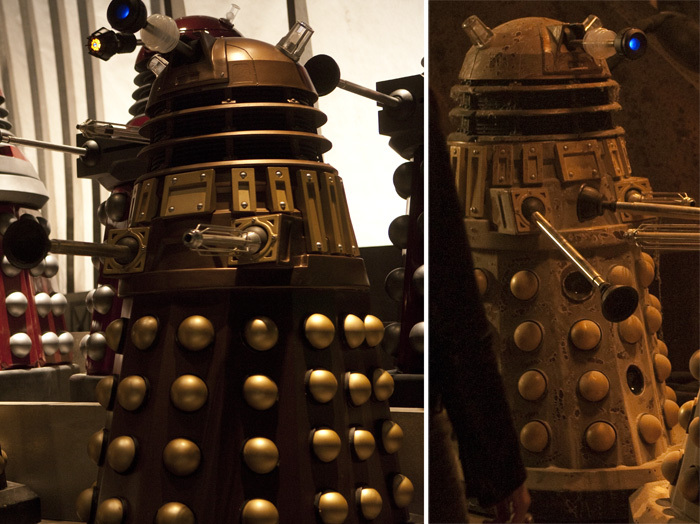 Both Daleks were repainted back to bronze and, as with the new Daleks, no weathering was applied. In the process of repainting, the slats of both props were removed. 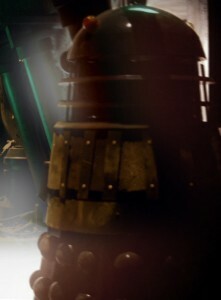 When they were reapplied, the upside-down long slat, which had been associated with NSD2 since The Stolen Earth in Series Four, switched to NSD4. NSD4 was also given standard sized bolt covers in its slats rather than the smaller versions it had when originally constructed. 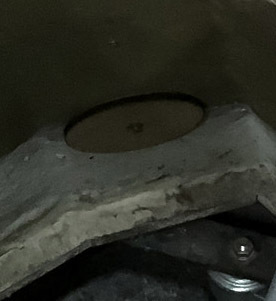 A crack in the fender of NSD4 was also now apparent having sustained the damage during its spell at The Doctor Who Experience. Of the three, only MT1 was utilised in the main asylum chambers and as such was dirtied down with dust. It featured heavily in the intensive care scenes when it was one of the three Daleks trapping The Doctor against a bulkhead door. Firstly it appears without a gun and an empty socket and then seconds later it has a fake gun attachment point placed in the hole. Belonging to Andrew Beech, this replica was the work of prop-builders Steve Allen, Alistair Lock and Dave Brian. 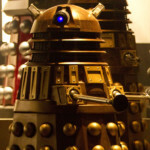 It was drafted in to serve at the Doctor Who Experience as part of the Dalek time-line. 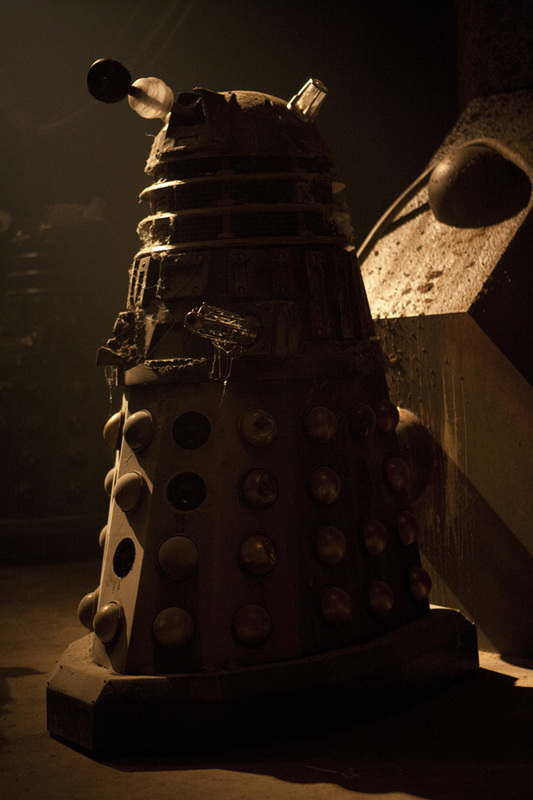 Initially it had a silver dome and effectively portrayed a ‘Chase’ style Dalek. It was decided that it would be more interesting to portray one of the Throne Room Daleks from Evil of the Daleks and was adjusted accordingly. The prop remained static and was only glimpsed in the background of some shots. 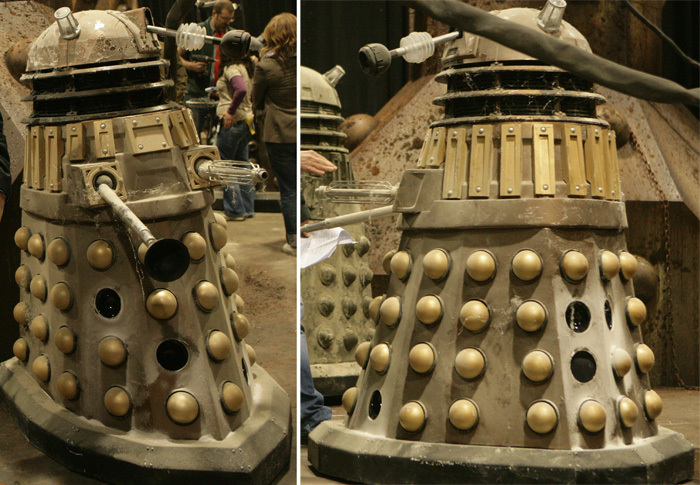 Also belonging to Andrew Beech and borrowed from The Doctor Who Experience, this replica was also initially a ‘Chase’ style Dalek but was heavily refurbished to become a Dalek in the style of the original TV props which included drilling through the skirt so that hemispheres could be inserted from the inside. Some of these were removed for the asylum scenes. The prop was on set in the Intensive Care sequence, but not seen. It is eventually only seen from one short high shot in the dream sequence. 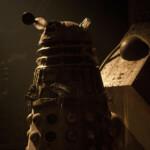 You can read more about Andrew Beech’s Daleks on the Series Five page. 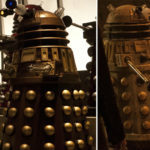 The third Dalek supplied by The Doctor Who Experience was again from its time-line display in the shape of the bronze NSD. 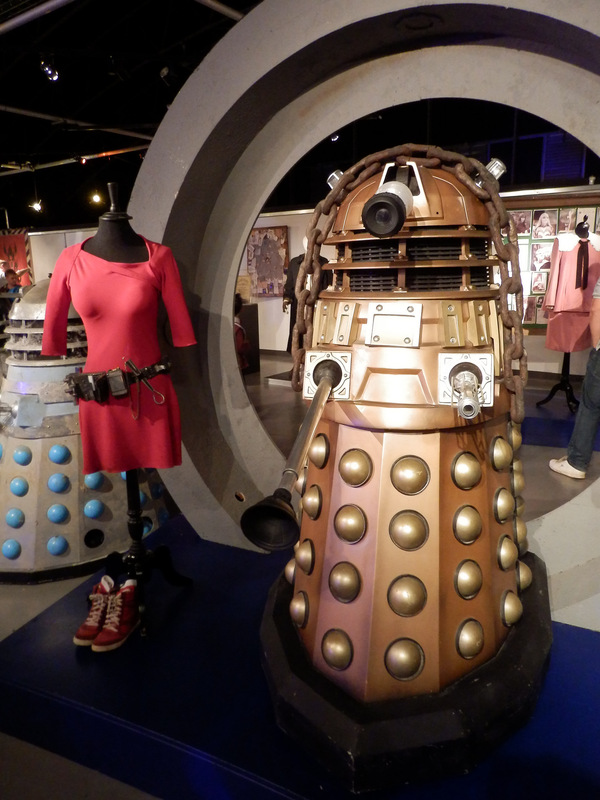 This Dalek was made up from two sections that appeared at other previous exhibitions. Originally made by This Planet Earth, it was made up of two props built for for the Earls Court display in 2008. The top half was from TPE EC2 and the skirt from TPE EC1. 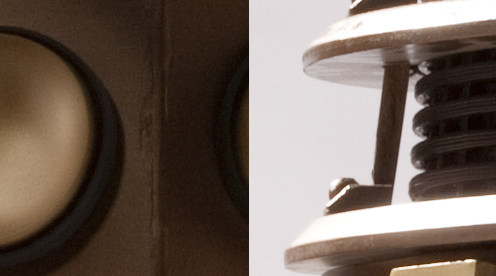 The Dalek is quite distinctive because its large centre slat is rotated and, very much like NSDA4, its lowest hemisphere on the right-hand front panel is positioned too low. In recent years, many exhibition bronze Daleks which were not intended for screen use had been supplied by This Planet Earth. They have a number of distinctive features, such as the cowl for the eye stalk being moulded directly onto the dome. The long slats tend to curve, following the shape of the shoulders, and there are other minor traits. The prop did get some action in the asylum when Rory approached it and gently pushed it away. Unfortunately, the sequence included a continuity error. The prop is seen in quick succession both with and without its left-hand dome light. 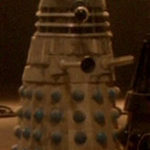 This Dalek is the only authentic, original Dalek from the classic series of Doctor Who. It was built in 1988 for Remembrance of the Daleks and its creation is documented on this page. The original intention was to have the sound of the gun powering up which alarmed Rory and caused him to flee. Along with Andrew Beech’s sixties props and TPE- EC2/EC1, it resided at the nearby Doctor Who Experience, which had proven a useful repository for borrowed props. It prop had been seen at many exhibitions since 1988 and had been refurbished by Mike Tucker’s team in readiness to go on display again at The Experience. This involved removing a great deal of the weathering that had been continually added to over the years. He also replaced some missing components on the gun. Charity Fundraisers ‘HireADalek’ also proved a fruitful source of Dalek props. 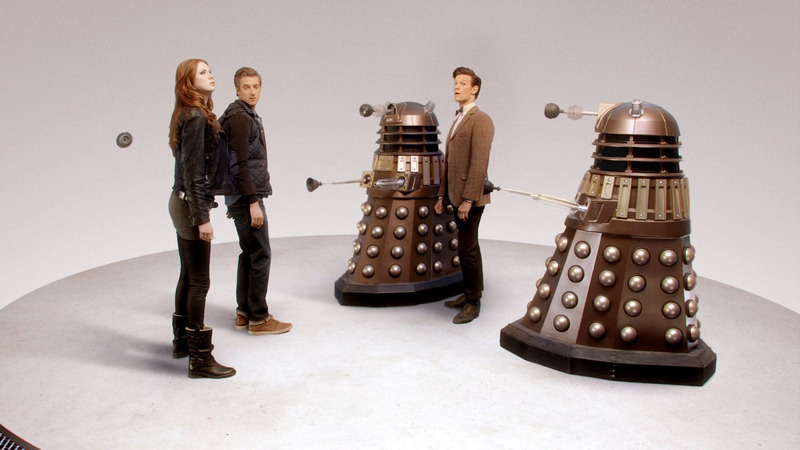 They had in their possession four Dalek props – three in ‘New Series’ style and one ‘classic’ style Dalek. Usually seen complete with saddle-bags, this fan-built replica was created as an Ironside – the military Daleks seen in Victory of the Daleks. It was dirtied down to such an extent that the green colour is almost completely lost on set, however its paint scheme was highlighted in a promotional poster that came with the Radio Times prior to transmission of the episode. It is a generally accurate prop with some small details which allow it to be identified, such as the front slat being slightly less tall than usual. 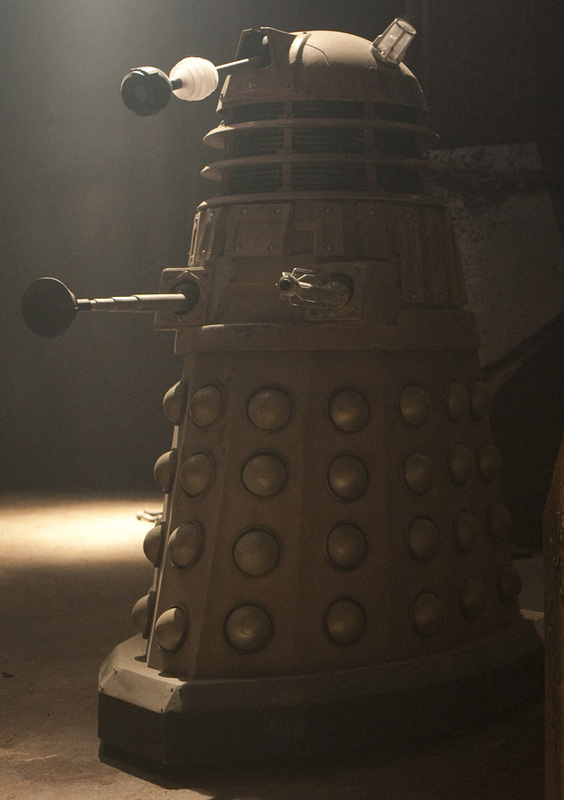 The art department added a Dalek stamp onto the dome for the scenes in the asylum, in addition to the weathering. Surprisingly, the Union Jack sticker remains on the dome which means that this isn’t simply a green Dalek, it really is one of the Ironsides that somehow escaped Earth during the Second World War. 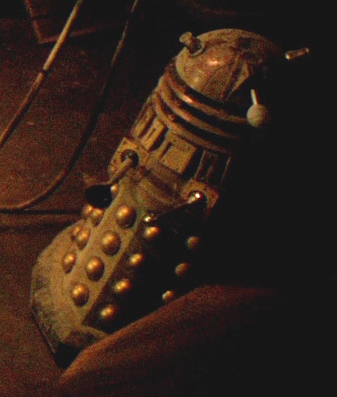 This replica bronze Dalek blends in very well amongst the official TV props and is quite hard to spot unless you look out for a couple of specific details. The front slat is slightly taller than normal and the “borders” of the slat are a little thicker. The placements of the rivets are quite distinctive, and there is only a very small gap between the slats around the side and the lower collar. There is also the addition of an extra ridge around the lower edge of the fender. The sticker on the dome identifies this Dalek as Dalek Caan. Enjoy working that fact into fan fiction regarding Journey’s End! This fan-built replica even has the correct ID badge to identify as Dalek Sec, rather than simply an identical-looking individual. How this is reconciled “in universe” is a challenge for fanfiction writers someday. It is a generally very accurate prop with some small details that allow it to be identified, such as a heaver-than-usual indentation either side of the eye stalk. The clearance of the fender off the ground is also a little higher than normal in a Dalek, which helps this prop get around during its charity outings. 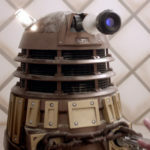 Known as Boris, the Dalek was originally constructed by This Planet Earth and is based on the grey Renegades seen in Remembrance of the Daleks. One of the few ways it differs from the original TV version is that it has has a proper mesh around the shoulder section, rather than foam which was dappled to create the appearance of mesh. For Asylum, it was fitted with a NSD style plunger and given a Dalek stamp on a solar slat on its left hand side. One of the most accurate fan replicas ever built, and incorporating some screen-used elements, this props is the work of Mark Barton Hill and is a fantastic testament to his meticulous attention to detail. 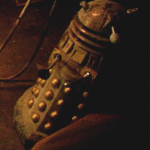 The prop is a precise copy of a specific Dalek prop which appeared in Resurrection of the Daleks. The skill with which its features are replicated is extremely impressive, right down to the supporting blocks under the slats and unusual shoulder mesh. The shoulders in question copy the dimensions of Dalek One which had the thin lower collar and, remarkably, still exists. 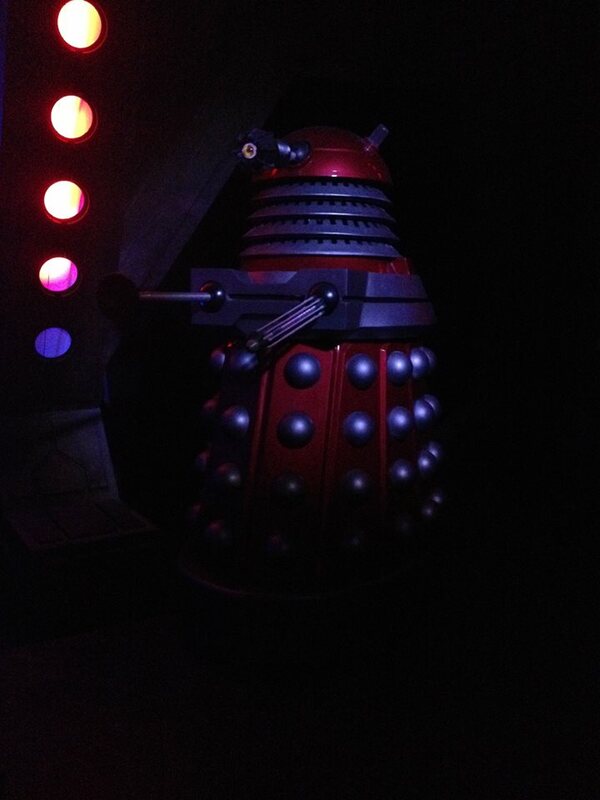 This was the fifth Dalek supplied by The Doctor Who Experience. Another replica of a classic Dalek came in the form of this impressive silver and black model from Death to the Daleks. Made by This Planet Earth and retailing at £3,495, this superb prop’s high contrast colour scheme would have been an exciting sight in the asylum. Sadly, however, it was given the most weathering of all the Daleks, to the point that most viewers would have assumed it was a standard grey Dalek as per Day of the Daleks. It is a particular shame because, unlike every other colour scheme of Dalek featured in the series’ history, it never appeared in more than one story. 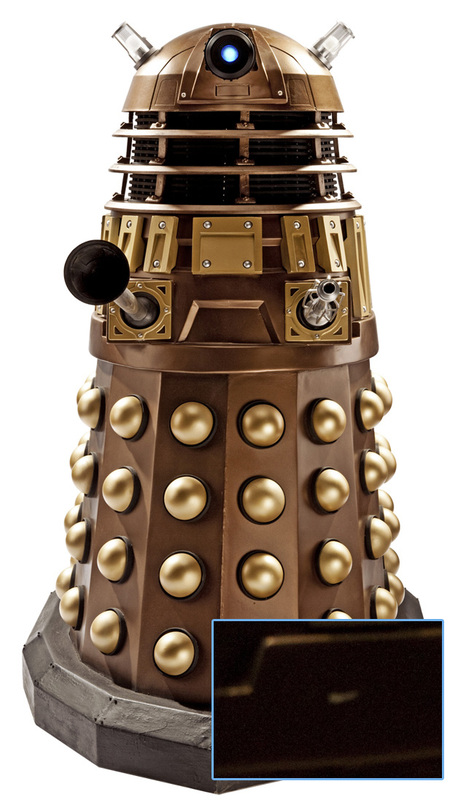 This type of Dalek can be bought from TPE – the only official retailer of replica Daleks at their website here. 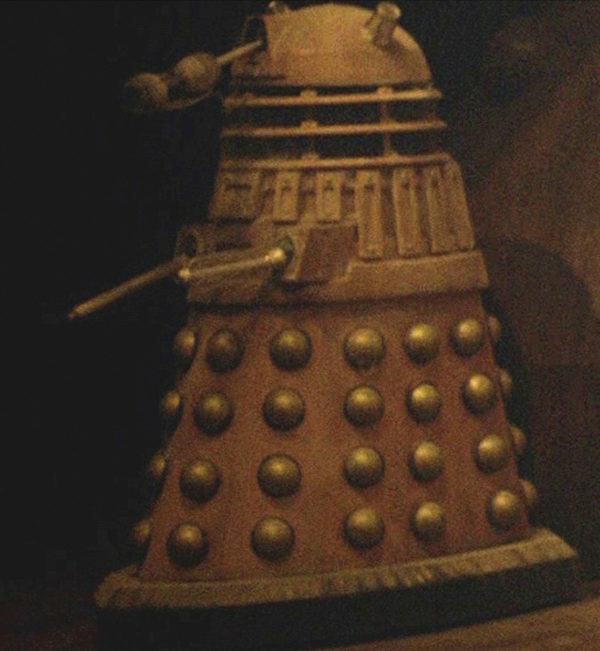 The final ‘classic’ Dalek used in the shooting of the story is often overlooked because it does not appear in the main chamber along with all the others. As the Eleventh Doctor escapes from the intensive care chamber a standard 70s era grey Dalek tries to block his path. It is owned by former executive producer, Russell T. Davies. At first glance it approximates the design seen in Day of the Daleks onwards however it has a number of minor differences. The slats on the shoulders are spaced apart more widely and the rivets are further towards the extremes of each slat. The lights on the dome are larger than usual and orange. Other aspects of the design have more in common with 1980s Daleks which had amalgamated goon Dalek components, whose necks and skirts were constructed slightly differently. It is the only classic-era prop seen in close-up. Like Dalek TPE EC2/EC1, this prop was an amalgamation of two different exhibition props also made by ‘This Planet Earth.’ It comprised of the top half of ‘Earls Court 1’ and the skirt of the ‘Spaceport’ Dalek. It came together in that configuration when its work travelling the country was finished and a prop was needed at Television Centre to replace TPE-TVC which had moved to Media City in Salford. The skirt section had previous screen time when it appeared with its own top section on the Paul O’Grady Show in April 2007. It was also used in a photoshoot for BBC Worldwide around the time of the recording of Asylum of the Daleks. The prop is seen lurking in the dark of the Asylum and gets very brief use in the Parliament scenes. Its noticeable by its very long eyestalk. Two ‘dead’ New Paradigm props were also seen lurking in several shots. Firstly the distressed white Supreme Dalek and the new blue NPD-A prop created by the in-house team from the new moulds. This prop’s dome was unfinished and didn’t include the eyestalk or one of the lights. Daleks in the asylum. Click for a larger view. In the main it was a batch of seven of the eight new bronze props that carried all the work in the finished asylum scenes. NSDA3 being the only complete new prop that didn’t appear in the gigantic, murky chamber. An unprecedented fifteen Dalek operators were required for the story including stalwarts Barnaby Edwards and Nicholas Pegg. Edwards and Pegg carried out all the main work that involved complicated manoeuvres and so found themselves hopping between a number of the different props. There was occasional use of the radio controlled domes being fitted to props without an operator. As Amy enters the chamber in which she hallucinates a ballerina and other people (who are, in fact Daleks), a high shot includes five of the aforementioned twelve borrowed Daleks. 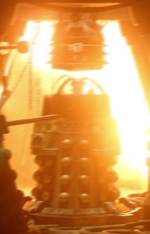 The Special Weapons Dalek was excluded from this view because its inclusion would have given away the fact that this was the same set that Rory had been seen in earlier in the story. 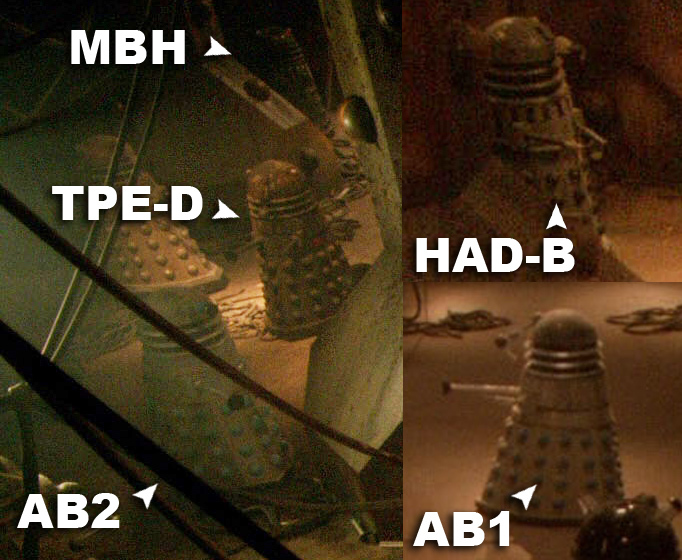 This illustration (above right) shows where each of the Daleks is lurking and is labelled using the above terms of reference. The RealSFX team test pulling NSDAD2 with Barnaby Edwards inside. Click for a larger view. Great use was made of the two ‘damaged’ Daleks NSDAD1 and NSDAD2. Barnaby Edwards operated NSDAD2 when, despite its sad appearance, it came to life and came down a corridor towards The Doctor. It was then propelled backwards before being substituted for a huge explosive effect that required the use of a reinforced Dalek prop to stand in. Scott Wayland had been involved in Doctor Who, Daleks and special effects since the series returned and was involved in the original build of the New Series Dalek with Mike Tucker. 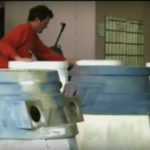 By 2013 he was no longer directly employed by Doctor Who but was still involved with Danny Hargreaves’ company RealFX for whom he made breakable props including Dalek sections such as in The Stolen Earth. Scott Wayland’s ‘Dalek Sec’ is prepared for destruction. Click for a larger view. 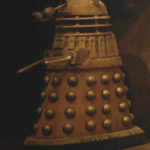 Hargreaves found himself in need for an FX prop for the explosive ending of NSDAD2 and with all the existing props being used, another lightweight Dalek would be required quickly. Hargreaves turned to Wayland again but in this case he was unable to construct a prop quickly enough in the short timescale and so an alternative method was construed. Wayland had in his possession a ‘Dalek Sec’ replica that he decided that could be donated for the effect. 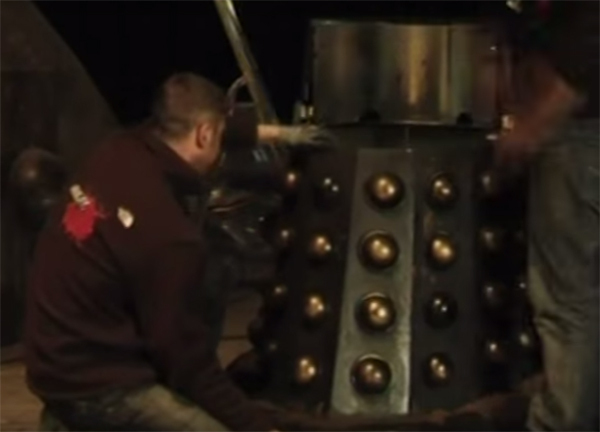 A hectic four days ensued that involved Hargreaves and his team marking and cutting up sections of the Dalek before being reassembled with brackets. The inside of the prop was lined with metal plates to withstand the blast of the explosion. Mindful that parts would fly off, several lightweight sections were formed for it including the dome, eye and arms. 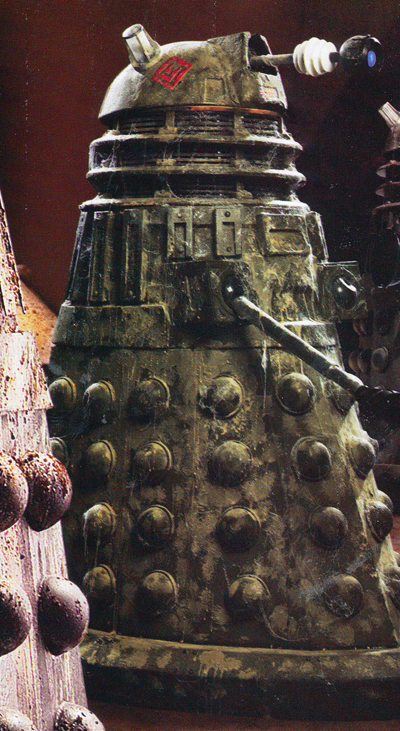 The prop was dirtied as per the rest of the asylum Daleks and the hemispheres given a bronze tint to give the impression that there was colour showing through the grime. After exchanging places with NSDAD2, the effect was carried out on set with tremendous results. The strengthening plates inside the Dalek ensured that only minor damage was caused to the prop and so the various sections were salvaged and were returned to Wayland. In addition to the many props already provided by the in-house team, they also provided a number of heavily distressed skirt sections for the aftermath of the Dalek explosion and a specially constructed ‘open’ Dalek that was seen in the intensive care scenes. To save time constructing a full prop, the skirt was donated by NSDA2. The top section had extra detailing that is revealed by the shoulder section which was split down the centre and opened out. The dome and neck section were suspended above the rest of of the prop and extra detailing was added to the top of the neck section. 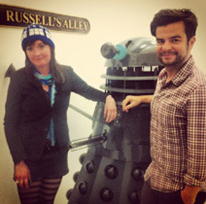 NSD4 becomes the ‘Oswin’ Dalek and now had the upside-down slat. Click for larger view. 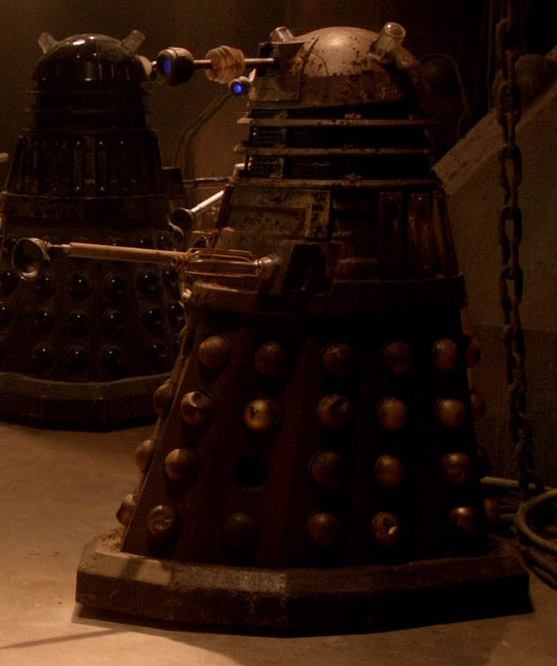 For the ‘intensive care’ scenes, a number of the bronze Daleks were placed into cages and chained. 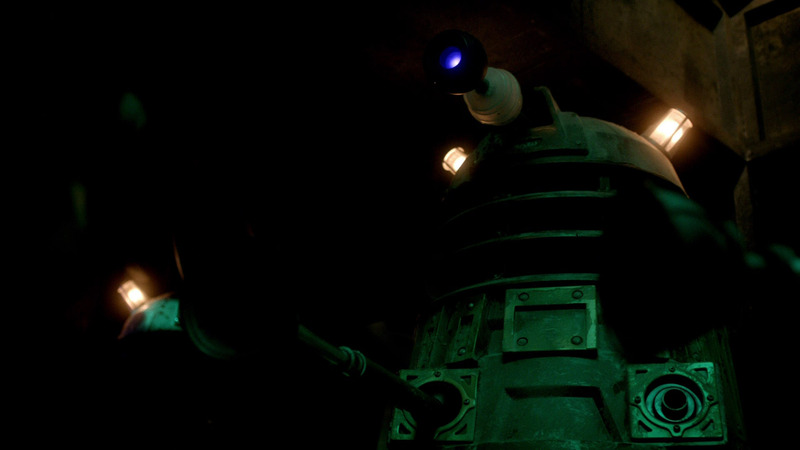 To try and give the appearance these were different Daleks to those in the main chambers, several had limbs removed. Daleks in the area included MT1, NSDA1, NSDA5, NSDA6, NSDAD1 and NSDAD2. AB2 was also in a cage but was not seen in the final footage. 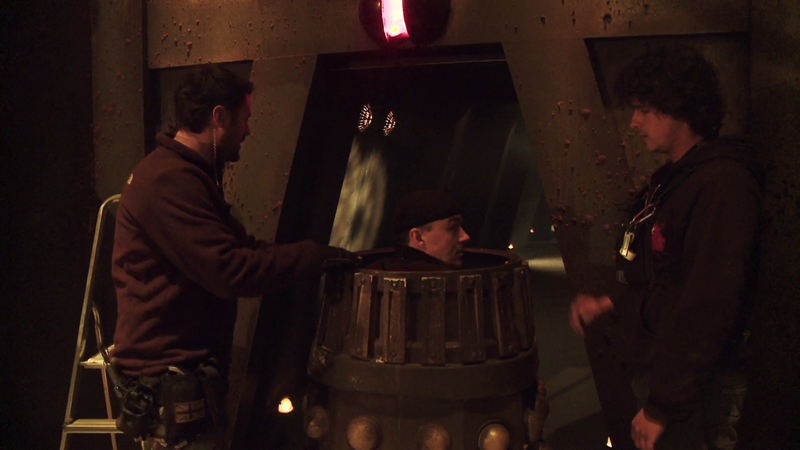 With filming now running into early April, it was NSD4s turn to be dirtied down for use in the chamber where the ‘Oswin Dalek’ was chained down. Another continuity error occurred at this time when two domes with different ID tags were used when the Dalek was chained. The circle of wood holding the hemisphere in place. Click for a larger view. Once the asylum scenes were in the can, the props were cleaned up for their appearance in the Parliament. The blue NPD-A was also completed with its eyestalk and light. 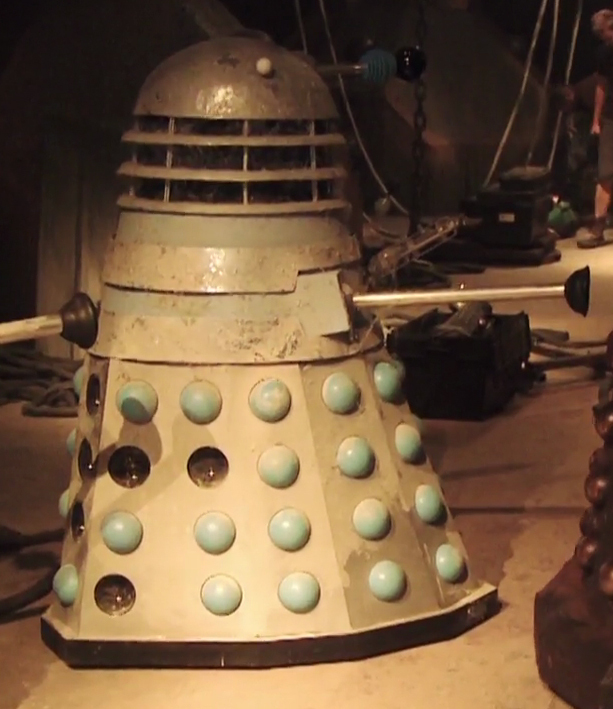 No less than seventeen Daleks props made their way to the large set. The three bronze Daleks that had missing hemispheres (NSDA 4, 5, and 6) had them refitted back in place to make them complete Daleks again. This was achieved by placing a circle of wood behind the hole inside the skirt. Each ‘missing’ hemisphere was then screwed into place through the wooden circle. Unfortunately, because the wooden brace was set back behind the hole, the hemisphere sat deeper and it appeared as if it was sinking into the skirt. They would also occasionally come loose and slip out of position. The Dalek Parliament. Click for a larger view. The Parliament was set up so that as the camera faced the ‘Prime Minister’ mutant in its tank. Either side of the ramp leading to the Prime Minister were tiered levels for the Daleks to stand on. There was a column of three Daleks to the left and nine to the right. These were duplicated in post production. The majority of the brand new New Paradigm props made their first appearance at this time although, bar the Supreme Dalek, none did more than move its head. The redesigned NPD-A skirt section was only seen briefly when the Supreme Dalek turned to face the Prime Minister. The lefthand column of Daleks is briefly seen. Click for a larger view. 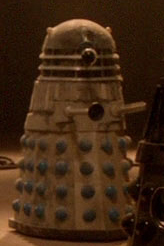 The left-hand column of Daleks consisted of the blue NPD-A at the rear, NSDA4 in the centre and TPE EC2/EC1 at the front. This prop had a different neck to that it was seen with in the asylum. Its neck rings have a series of notches cut into it suggesting the casing has been slashed downwards with a powerful weapon. This damaged neck section was seen on NSDA5 in the asylum but can also be seen in the parliament scenes although due to the alignment of the damage and the overhead lighting, it is easy to mistake it for a shadow. This prop’s head also sits askew on the neck section, which is quirk shared by several of the new batch of props. 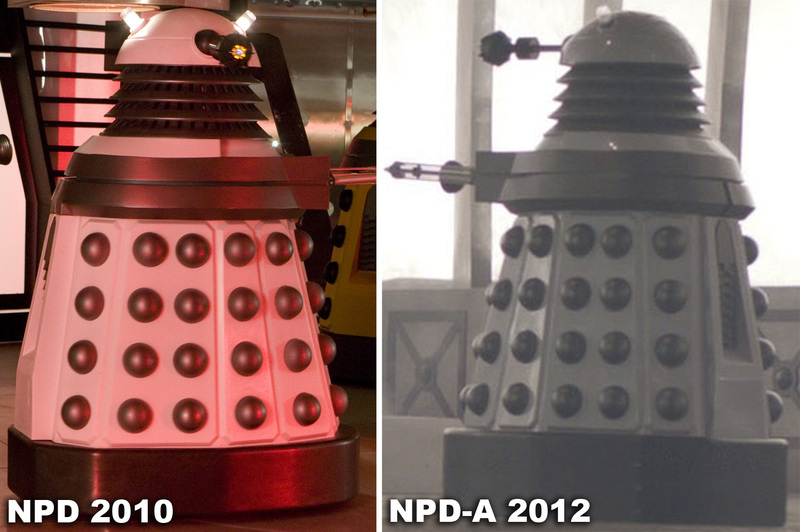 A third CGI Dalek appears in front of the blue NPD-A at one stage when the view changes to the top of the ramp looking back into the Parliament, although, the Dalek appears to be missing an arm. 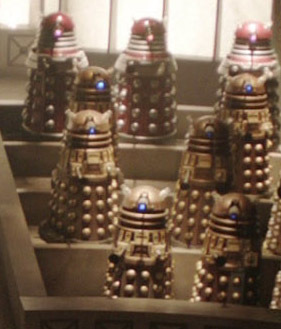 The group of nine real Daleks on the right of the ramp. Click for a larger view. On the right hand side, the three burgundy red NPD-As were arranged along the back row with NSDA2 and NSDA5 in front of them. NSDA1 and NSDA3 then made up in middle row of bronze Daleks. 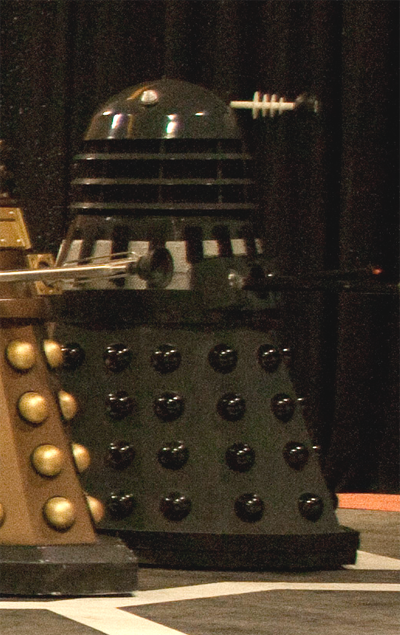 Mark Barton Hill, whose replica Dalek (MBH) was used in the asylum, operated NSDA3. MT1 appears in the bottom left position but unfortunately is generally obscured by the other Daleks on the floor level. Its relative age is shown by the fact that its dome has an ID sticker on which can be seen to be peeling at the edges. Beneath this sticker, its original, hand-painted ID badge was still present. As well as the distinctive oil runs on the skirt which had been reapplied in 2008, a useful identifying feature is a missing bolt cover at the bottom of the third long slat on the left side. NSDA6 then makes up the numbers at the front right position and the Supreme NPD-A was free to roam at the top of the ramp. NSD2 (left) and NSD4 in the lift. Click for a larger view. After MT1, NSD2 and NSD4 were the next oldest props in use. With the hastily manufactured new props consigned to the relative background, the two older props were still deemed the props to take most of the limelight. 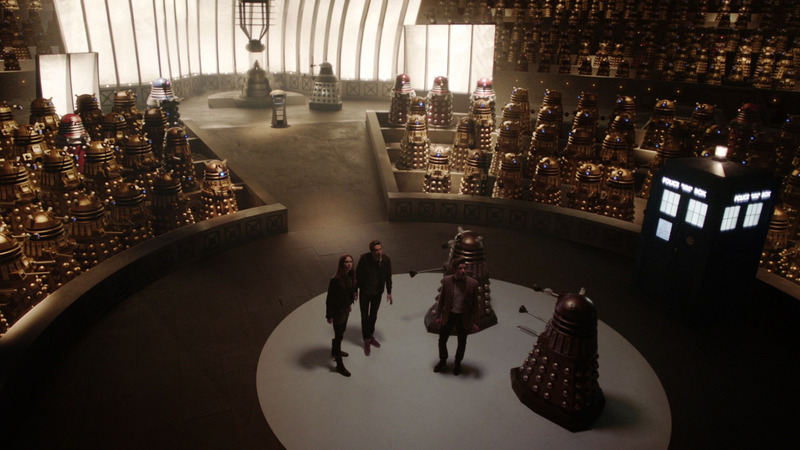 Both props escorted the Doctor, Amy and Rory on the lift platform and then became the two Daleks on the floor area in the Parliament. Barnaby Edwards operated NSD2 whilst Nicholas Pegg to charge of NSD4. The unfortunate reversed image. Click for a larger view. Two other bronze Daleks were on set and used very briefly with the camera appeared to look over the top of them and into the main set. TPE EC1/SP and HireADalek ‘Goldie’ (HAD-G) served this purpose. HAD-G had its arm and gun removed so that they would not obscure the frame of the shot. 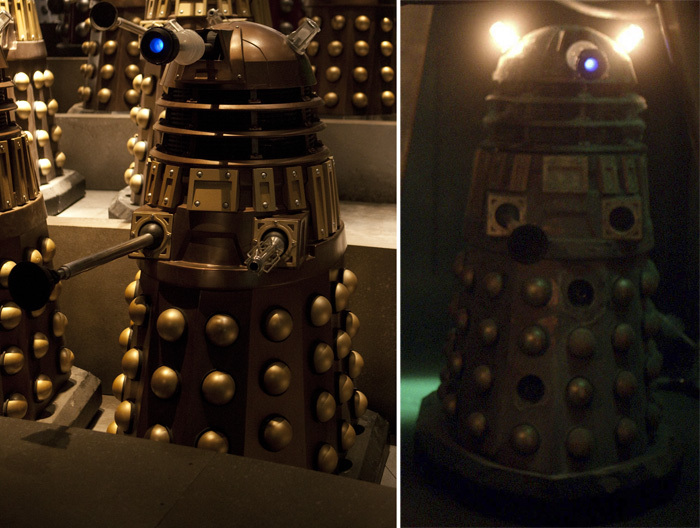 A couple of brief general shots of the Daleks were inserted in the Parliament scenes that were actually reversed. This was an easy way to give the impression there were more Daleks to the left of the ramp than there actually were but had the unfortunate effect of reversing the gun and arms. 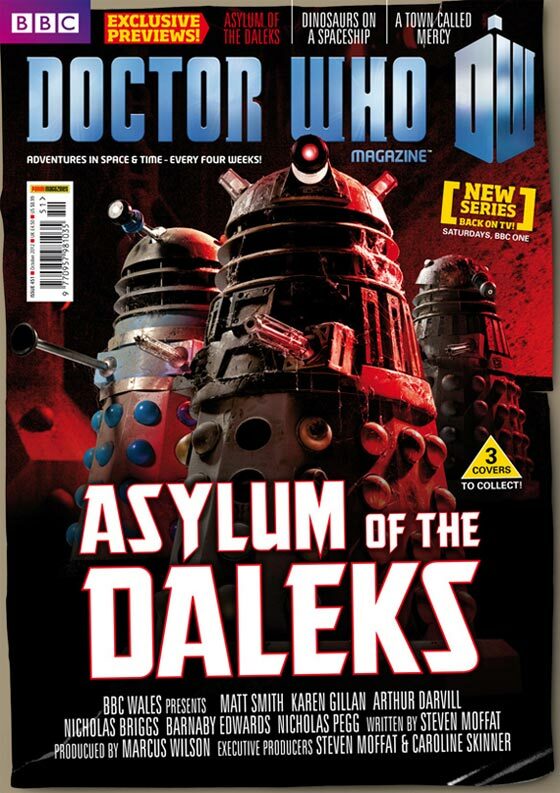 The second DWM ‘Asylum’ cover. Click for a larger view. 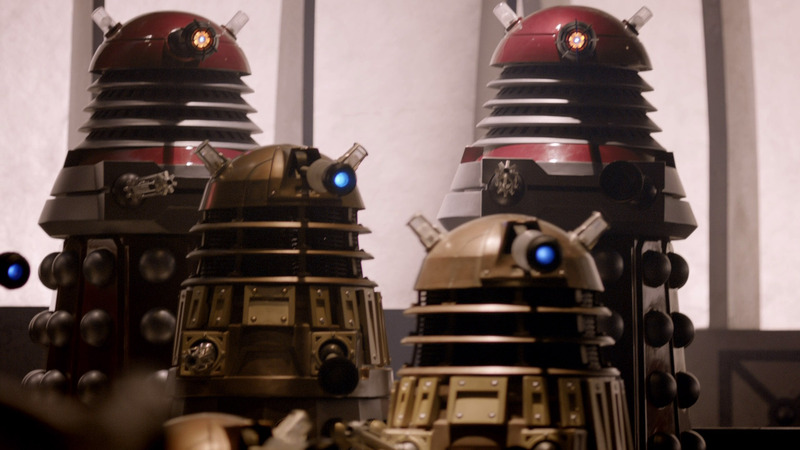 Asylum of the Daleks was transmitted on 1st September 2012 and, as the Series Seven opener, it received heavy promotion not least because it included so many older style Daleks. 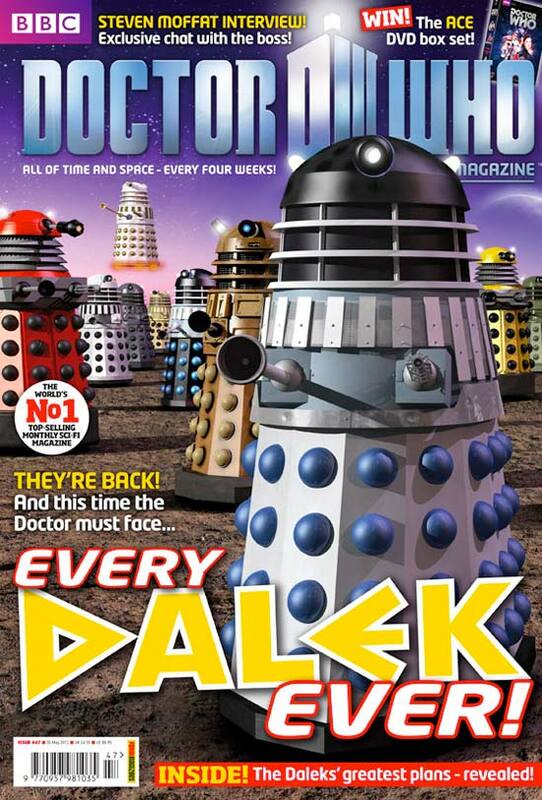 Doctor Who Magazine featured the Daleks on their cover again for the opening of the new season. Three ‘collectable’ covers were created, each featuring one of the first three stories. For the Dalek cover, NSDAD1 was the main Dalek in the centre which gave a great view of all the damage that had been added to the prop. It was flanked by AB2 on the left and TPE-D on the right. The Radio Times also promoted the story with a cover. It mainly featured the show’s main three leads but tucked into the background were the new blue and burgundy NPD-A props. For Dalek fans, they also included a full ‘pull-out’ wallchart showing many of the Daleks that would be seen. From left to right they were: AB2, AB1 (which had its arm sections removed and placed in the gun socket), HAD-B, SWD, MBH, TPE-D, HAD-C and NSDAD1. Next came the only bronze prop – TPE EC1/SP. The picture was taken from the BBC Worldwide photoshoot mentioned in the prop notes above. Interestingly, in the picture it had the dome of TPE EC2/EC1 which still retained a big globule of the glue like cobweb substance used in the asylum. The Dalek usually resided at Television Centre in London for visitors on the tour of the studios and when it was returned after recording and the photoshoot it had its usual dome back in place. On the far right was one of the new burgundy NPD-A props. Although the new NPD-A design received some praise, reaction to the episode itself was fairly muted from some areas of fandom. Whilst the script itself was clever, full of drama, insight into the Daleks’ lives society, human interest, incredible set-pieces and a huge surprise in the early reveal of the new companion, the transfer to screen didn’t quite hit the mark for Dalek fans. Visually it was fantastic – with a beautifully cinematic quality, but the director’s choices in the use of props in certain scenes unfortunately undermined some of the intentions of the script and the ambitions of Steven Moffat. The yellow ‘Live’ NPD at the opening of The Experience. Click for a larger view. The Doctor Who Experience at Olympia had closed in February 2012 but with the BBC moving its studios to Roath Lock in Cardiff, it moved to a purpose built exhibition hall nearby. The hall offered two floors and so there was plenty of room for further expansion of the exhibits. It reopened in July 2012 and the yellow NPD that had been made by MillenniunFX for the ‘Live’ shows in 2010 was on hand to wow the visitors outside the hall on the first day. It then went on display in the reception area for a time. The new AB3 (left) and AB4. Click for a larger view. 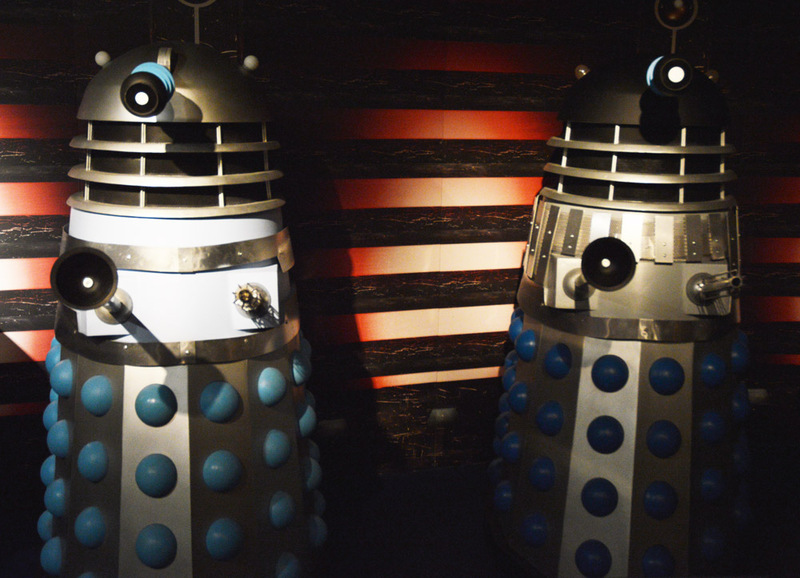 The Dalek time-line was reconstructed, but this time it featured several different Dalek props to the original London display. 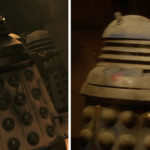 The ‘exhibition’ Davros and hero yellow NPD still remained but the sixties style Daleks were two new props that had come from the same source as the original AB1 and AB2 – Andrew Beech. Dalek builders Steve Allen and Dave Brian cast two Daleks ‘shells’ for Beech which were then passed to Mike Tucker at The Model Unit for completion. We will term these Daleks AB3 and AB4 (Andrew Beech 3 & 4). Tucker and his team set about recreating new ‘Dead Planet’ (AB3) and ‘Evil of the Daleks’ (AB4) style Daleks which included cutting holes in the skirt and pushing hemispheres through from the inside as per the original Shawcraft design. NSDA3 showing its scratch on the lower collar. Click for a larger view. After extensive cleaning by Mark Barton Hill, which caused a little damage to the original paint, the replica of Dalek One-7 (MBH) was also back on show alongside the Special Weapons Dalek. A different bronze Dalek was used in the display though. With future plans for TPE EC2/EC1, which had been used in London, it was hero prop NSDA3 that took it place. The scratch on the lower collar that appeared during its time in the Parliament was still evident. Incidentally, the aforementioned major photoshoot utilising NSDA3 provided a number of large wall stickers that were applied around areas of the display hall. 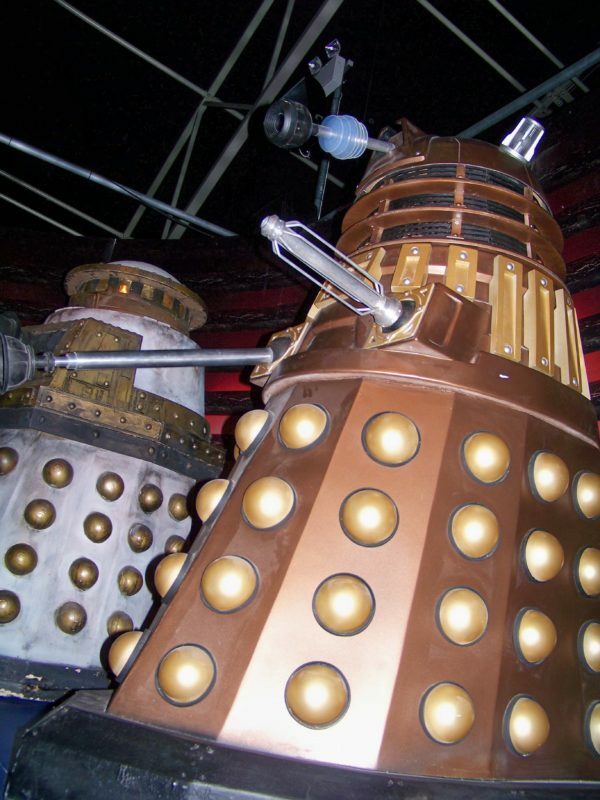 The MillenniumFX props were repainted to resemble the ‘Parliament’ Daleks. Picture – Bedwr Gullidge. Click for a larger view. Upon opening, the interactive section of The Experience remained relatively unchanged. 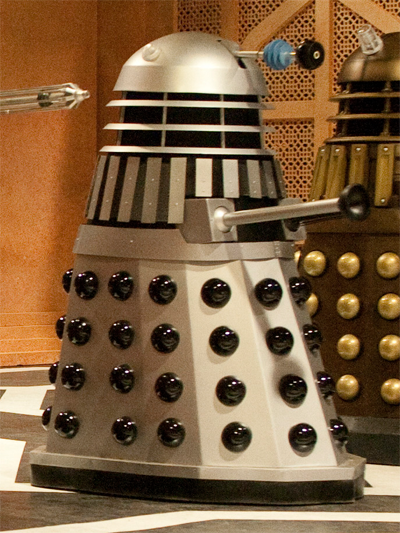 The Dalek spacecraft set still featured the three New Paradigm Daleks that had been manufactured by MillenniumFX. 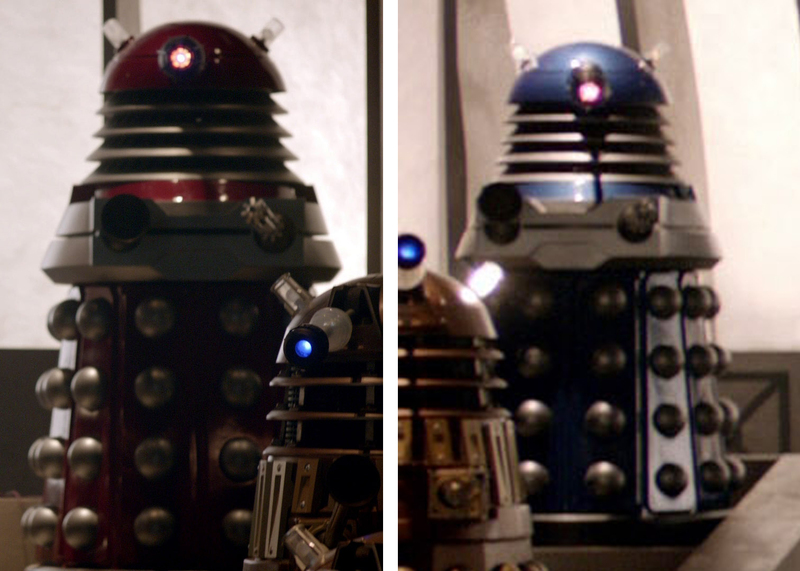 After the transmission of Asylum of the Daleks, the two red drone props were given a repaint to reflect the new finishes that had been seen in that story. One was painted the metallic red and one metallic blue. TPE EC2/EC1 as the ‘Oswin’ Dalek. Click for a larger view. Back in the main hall, and with no need to keep plot elements under wraps, a special selection of props was added in a separate display to the Dalek time-line. TPE EC2/EC1 took the part of the ‘Oswin’ Dalek and was arranged with some chains over its dome and stood next to Jenna Coleman’s costume and a section of set from Oswin’s ‘ship’. The prop was reunited with its own dome after temporarily loaning it to TPE EC1/SP for the BBC Worldwide photoshoot. NSDA5 stands outside the Tardis set at Roath Lock. Picture – Alun Vega. Click for a larger view. With the move right next to the Roath Lock Studios, The Experience was able to offer TARDIS set tours at times when it wasn’t being used for filming. Visitors were allowed to step into the real TARDIS set and experience the show in a way that was unavailable until now. 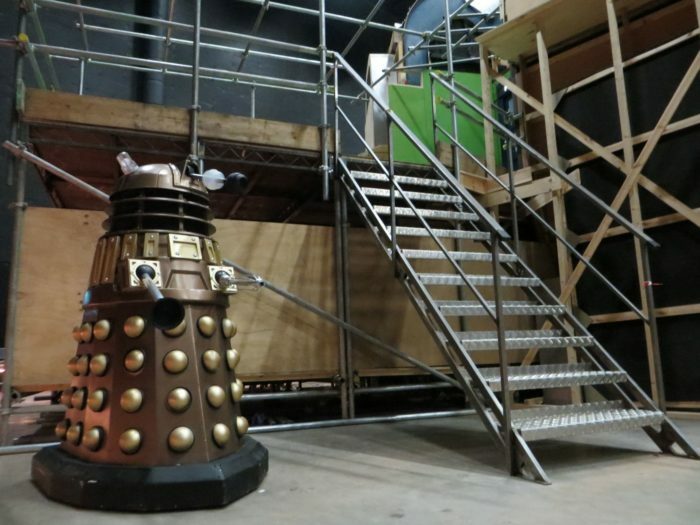 Outside the TARDIS set were a number of other props of interest which included one of the current exterior TARDIS props2 and two Daleks. 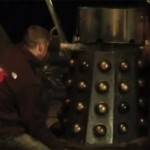 In general it was the new batch of bronze Daleks that served this purpose alongside the new white Supreme prop. Generally it was NSDA4 and NSDA5 that appeared but these sometimes changed after the studio was used for filming. 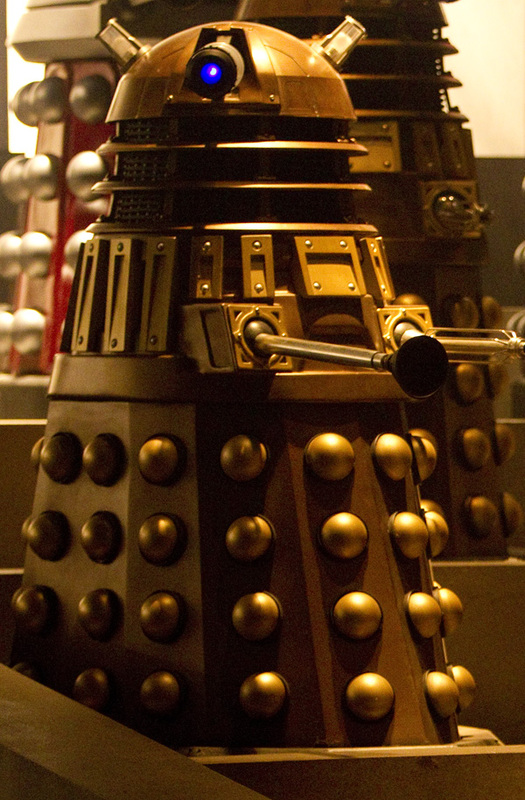 One of the Daleks usually had its neck and dome removed so that visitors could see inside the main body. The brand new NPD-A props or a bronze NSD could also be seen in the reception of the studios at various times. Again, these would tend to change depending on what props were easiest to retrieve from storage. As the calendar turned to 2013 and the second half of Series Seven began transmission, thoughts were turning towards the 50th anniversary in November. The excitement was mounting but also tempered by the fact that once the eight episodes had aired, that would be it until November. However, appreciating the long wait for fans, the BBC began to conceive several events that would keep the show in the public eye and continue the momentum towards 23rd November.